Rhode Island Department of Labor and Training – Both agencies work cooperatively to connect economically disadvantaged ex-offenders with educational, training and employment services to achieve positive employment outcomes. This partnership further, ensures employer participation in the Federal Bonding Program, (fidelity bonding for the first six months of employment for hard-to-place job applicants) and employer related tax and insurance incentive program participation, which encourages employers to hire participants. New England Institute of Technology Ship building/Marine and Advanced Manufacturing Institute (SAMI) – This partnership provides Man Up participants with information about the realities of working in the 21st century shipbuilding/marine and advanced manufacturing industries; prepares participants who are interested and eligible for training and job opportunities as machinist and welders and connects them with Rhode Island employers who need qualified workers. Building Futures - This partnership offers Man Up participants preparation for rewarding careers in the commercial construction industry. The training consists of a multi-week, comprehensive evaluation and preparation process to help participants determine their interest and readiness for entering a construction apprenticeship program. Their program also provides career exploration, coursework and social service support. Once placed in a quality apprenticeship program, Building Futures graduates gain on-the-job training, while earning good salaries and receiving benefits, and are provided continued support services. RI Construction Training Academy (RICTA) – RI Construction Training Academy (RICTA) is a state approved apprenticeship program that has been training apprentices in Rhode Island since 1992. RICTA offers Man Up participants apprenticeship classes that are designed to meet the state requirement of training (144 houses each year). Rhode Island Manufacturers Association (RIMA) – RIMA is committed to developing an energetic, positive business climate that retains existing businesses, while also attracting new businesses and capital. Education, workforce training and closing the manufacturing skills gap are some of their primary focal points. RIMA assists Man Up participants to obtain certification in the Advanced Manufacturing Computer Numerical Control (CNC) Mechanist trade through their partnership with the RI Manufacturing Institute. Community College of Rhode Island, Introduction to Manufacturing Certificate - This program builds the basic skills and knowledge for employment opportunities in CNC manufacturing environment. The certificate covers areas of science and mathematics as they apply to machining practices and CNC programming. Emphasis is placed on both theoretical and practical phases of the design, cost, and production of machine parts. Certificate completion prepares students to enroll in a second, more advanced CNC centered certificate – CNC Manufacturing and 3D-Modeling (ETCA). The combination of the two certificates can be applied towards the Engineering Systems Technology Degree. The Rhode Island Marine Trades Association – Founded in 1964, the Rhode Island Marine Trades Association represents all aspects of the marine industry. 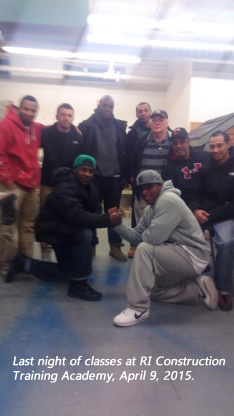 RIPTA offers Man Up participants an opportunity to enroll in their Pre-Apprenticeship Training Program to learn all the skills needed to get started on a career track in the marine trades industry. This 205 hour hands-on training prepares participants in several entry level areas: Painting, Varnishing, Composites, Mechanics, hauling, and more. Teamsters Local 251 Driver Training - This program seeks to train highly qualified, professional, safe commercial truck drivers to fill the demand of local employers in the Transportation Industry and IBEW Local 99 that are actively looking to employ these individuals. Through a comprehensive eight-week training course, participants will be prepared for a successful career with wages that exceed Rhode Island’s median wage. TechHire Rhode Island - To meet the needs of the rapidly changing Information Technology Industry, this partnership aims to train and place Rhode Islanders into entry-level technology jobs through an online marketplace that facilitates interactions between individuals, education providers, and employers. The partnership endeavors to expand learning pathways, transform hiring practices, and build inclusive tech communities. New England Tractor Trailer Training School (NETTS) - Serving area residents for 40+ years, our career training facility includes classroom training and a dedicated truck driving range to practice maneuvering techniques on our tractor trailers. Our Pawtucket truck driving courses include a mixture of both classroom and behind the wheel training. In addition to safety procedures, you will learn both the technical and operational aspects of the vehicle you are training to drive. Once you have mastered the handling and maneuvering of the tractor trailer, you’ll be ready to take your commercial driver’s license examination! HVAC Technical Training School - Our HVACR lab was built to deliver a hands-on experience for those interested in training to become a heating and cooling professional. This program was designed to provide students with the electrical and mechanical knowledge, and performance skills required of entry-level technicians. You will learn to install, adjust, troubleshoot, maintain and repair residential and commercial refrigeration, heating, and air conditioning equipment. Our graduates receive EPA Certification, Oil Burner Training, and 4,000 hours towards their Massachusetts Refrigeration License. NETTTS has been recognized by the Rhode Island Department of Labor and Training Apprenticeship Council as an approved Heating, Ventilation, Air Conditioning and Refrigeration (HVACR) related technical instruction (RTI) provider. Additional information can be found at www.dlt.ri.gov/apprenticeship. Rhode Island Urban Apprenticeship Program - This partnership aims to create new talent pipelines for plumbing and pipefitting occupations through the development of training programs targeting women and minority groups that are underrepresented in the field. Through a pre-apprenticeship program, participants learn about the use and care of tools, OSHA safety, Smart Mark, basic math, and psychology in the workplace. This curriculum is intended to meet the work-force needs of employers and connect participants to employment in the plumbing, pipefitting, and refrigeration industry. After completing the pre-apprenticeship program, participants may apply to enter into an industry apprenticeship. Rhode Island Builders Association- Provides employment opportunities for skilled and certified individuals. Social Services - The hallmark of Man Up, Inc. is our comprehensive and holistic social support that we provide for men of color who are experiencing barriers to employment and wage-earning ability. Participants commit to maintaining a 12-15 month membership in the organization as we develop and individualize plans of action for each participant including, case management and referrals as well as structured activities and workshops that foster success. Thereafter, the participant’s employment, educational and social development activities are tracked for a four (4) year period.